AMETEK Brookfield's Powder Flow Tester delivers quick and easy analysis of powder flow behavior in industrial processing equipment. The AMETEK Brookfield PFT is ideal for manufacturers who process powders daily and want to minimize or eliminate the downtime and expense that occur when hoppers/silos fail to discharge. With the new Powder Flow Tester customers can also perform QC checks on incoming materials, quickly characterize new formulations for flowability and adjust composition to match the flow behavior of established products. The AMETEK Brookfield Powder Flow Tester features a variety of test options including: Flow Function, Time Consolidation, Wall Friction and Bulk Density. Time estimates for duration of each test are automatically calculated before start of test in case adjustments are needed. The operator also has a choice of graphical or tabular Data Output Format for each test plus calculations for arching dimension, rathole diameter, and hopper half-angle. 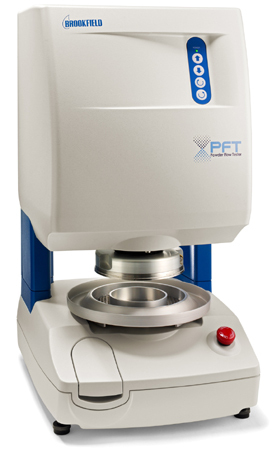 The PFT includes Powder Flow Pro Software, all accessories for handling powder samples, and features a small footprint that fits conveniently on a benchtop.